The Funky Felter: Funky's Fiber Artist Spotlight on Ingermaaike! A fellow feltmaker and Etsy seller! Funky's Fiber Artist Spotlight on Ingermaaike! A fellow feltmaker and Etsy seller! I first came across Ingermaaike through her flickr account several months ago now. Inger, a feltmaker from the Netherlands, has a wide array of images from finished items to her in action during the feltmaking process posted on flickr. Recently, it was her "Triple lips" vessel on flickr that really caught my eye. It is an amazing wet felted piece so be sure to check out its link above. I was pleasantly surprised to find that she has an Etsy shop too! 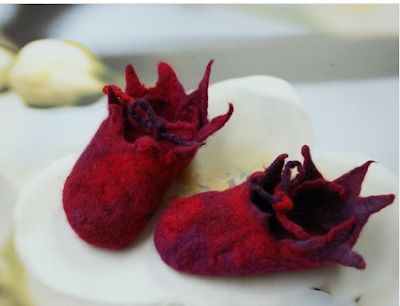 It is filled with her colorful scarves, animal creations, and a variety of other things including the elegant yet adorable baby booties in the featured photo. You can find out much more about Inger and see more of her gorgeous felts on her website. I highly recommend that you take a moment to browse all of her sites for inspiration and some great felted eye candy! *The image is a screen shot from ingermaaike.etsy.com.